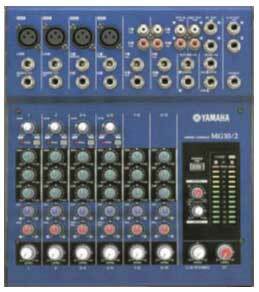 The fantastic Yamaha MG mixers are giving Mackie, Spirit and Behringer a run for their money. "We have a winner" and "reasonably priced, effects laden, mixer solution" says Music Mart magazine - Aug 03. The MG10/2 features a total of 10 input channels: four mono microphone/line inputs and two stereo line inputs, which offer mono microphone input capability. The microphone preamps provided on the mono channels and the two stereo channels would be worth the price of the entire mixer if packaged separately. These are high-performance head amplifiers that will bring out the best in any dynamic or condenser microphone. So you can take advantage of the superior sonic quality of professional-class studio condenser microphones, all four of the MG10/2’s high-performance mic preamps feature switchable phantom power. A single switch turns phantom power on or off for all four channels. Mono input channels feature insert I/O patch points so you can add compressors, EQ, or other extra signal-processing to the channels as required. Designed for smooth, "musical" response, the 3-band equalizers provided on all input channels are one more sonic tool you can use to create clean, professional mixes. All mono microphone input channels also feature a switchable high-pass filter that can be used to cut out unwanted low-frequency noise. The MG10/2 is also full equipped to handle external effects and monitor systems. Use the post-fader auxiliary sends in conjunction with the stereo auxiliary returns to add reverb, delay, or other external effects to the mix, and the pre-fader sends to feed a separate mix to your monitor system. What could be more convenient than having your mixer mounted on a microphone stand for freedom of placement and easy access? With the optional BMS-10A Mic Stand Adaptor you can do just that, and have your sonic control center within easy reach all the time.